As we approach the new year we are looking forward to an action packed 2008. From a cycle campaigning point of view the big event in the year will be the 2008 London Mayorial and Greater London Authority elections. In order to take part in the elections you will need to be registered to vote – to find out if you are registered to vote contact Electoral Services at Lambeth on 020 7926 2685, email electoralservices@lambeth.gov.uk or click on the electoral services page of the Lambeth website. In November we met to plan our 2008 Architecture Rides (our fourth full year), and this year we have decided to rerun some of our old favourites as well as continuing with more new rides. In February our ride will look at the architecture of libraries. Libraries have played a very important role in promoting education and knowledge from early times to the present day. The ride will examine the full range of libraries in London from the ornate architecture of the old libraries through the boom in library building in the nineteenth century to the ground breaking architecture of modern libraries such as Peckham Library and the British Library in Kings Cross. In March we will ride on to Cinemas Reborn looking at the architecture of the many cinemas across London. 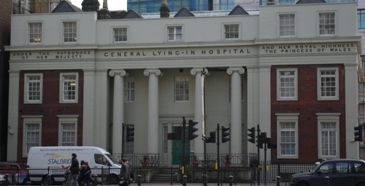 Following the boom in the early-mid twentieth century many cinema buildings have now been converted to other uses but they still retain distinctive cinema features. This ride will look of some the most notable current and former cinemas across London. Further information on the rides can be found on the email group and on our website nearer to the time. Our monthly architecture rides continue to be well-attended, varied and inventive. There was no running out of steam in November 2007 as we went on a tour of railway station architecture, inspired by the re-opening and re-invention of St Pancras. As well as the great termini we examined lesser known gems like the lavishly Italianate Battersea Park Station and the disused Waterloo Necropolis Station. Engineering necessarily took a more prominent place in this ride than in previous ones and as we assessed sheds, ribs, bowstring trusses and ridge-and-furrow glazing healthy debates were had about where engineering ends and architecture begins. The 1960s built Euston had few defenders but it did offer a fine railway-centric pub for lunch. Testament to the interest of the ride were the numbers who stayed with it till after dark, finishing with a lament for the abandoned Eurostar terminal at Waterloo. On Tuesday 18 December 2007 in place of our normal meeting we will be having a Christmas Party. So join us from 8:30pm onwards downstairs at the Bread and Roses pub, Clapham Manor Street, SW4 for a celebration of our achievements over the past year. In November 2007 we ran a stall in one of our more esoteric locations when we joined with other environmental organisations and charities at the Synergy Project, a multiroom ‘indoor musical festival’ style clubnight in the SEOne nightclub underneath London Bridge station. We were invited along following discussions at the green fair in Brixton and were able to hand out lots of leaflets and maps and speak to people, many of whom had not come into contact with the London Cycling Campaign before. Following November’s Synergy success we will be at having another stall on Friday 8 February 2008 at the SEOne Club – further information at www.thesynergyproject.org. 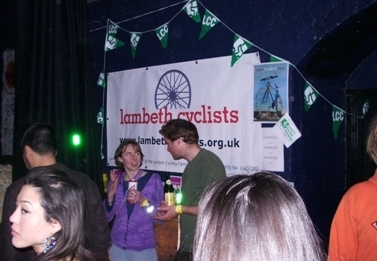 Lambeth Cyclists’ Annual General Meeting will be held on Tuesday 17 April 2007 at 8:30pm. This will be a chance to review events over the past year and elect the new Management Committee. As there are no elections due this year we will be joined by Simon Brammer, Director of London Cycling Campaign, to hear about his vision for the LCC and cycling in London over the next few years. This should be very interesting and informative. As this is Simon’s first visit to one of our meetings it will also be a good opportunity for us to feedback to LCC central office the concerns of Lambeth cyclists. At the AGM the Management Committee posts of Borough Coordinator (Chair), Treasurer and four or five other members, responsible for areas of working such as communications, rides, council liaison and campaigning are up for election.